Good: Whopping 18 hits per box, Best Bowman Sterling design in years, Fantastic selection of high-end rookie autographs, refractors, and patches. 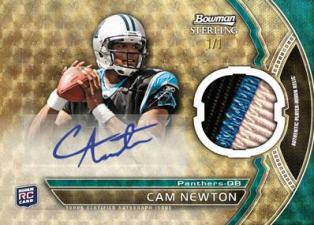 The Bottom Line: Though not a groundbreaking set by any means, an abundance of hits, along with a polished design and an intelligent rookie checklist make 2011 Bowman Sterling Football one of the best football card offerings of the year. 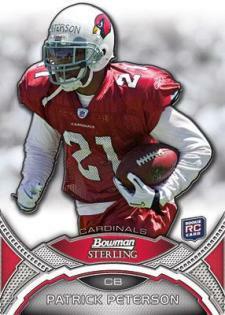 There is plenty to like about the look of 2011 Bowman Sterling Football. I haven't cared for the design the last couple of years so this was a pleasant, if unexpected surprise. The colored refractors look particularly good – especially when coupled with multicolored jersey patches. Unlike a number of Panini's 2011 rookie centric football card products, 2011 Bowman Sterling Football's rookie checklist isn't diluted by an excessive amounts of offensive lineman, defensive players, undrafted free agents and other undesirable rookie subjects. That's not to say that the rookie checklist is absent of any disappointments - after all not every player has the collectibility of Cam Newton or Andy Dalton. However Topps did a much better job of complementing these types of blue chip prospects with an assortment of less heralded, but still collectible, mid tier rookie prospects. Each $200+ hobby box of Bowman Sterling packs 18 hits. That equates to approximately $11-$14 per hit. Most products break down to $20 plus per hit.Considering the plethora of high dollar hits to be had in 2011 Bowman Sterling Football compared to the average football card product, this is a phenomenal deal. 2011 Bowman Sterling Football is a rare product in that it couples the excitement of high stakes hit potential with the enjoyment of opening and pulling a substantial number of cards. That alone makes for a very enjoyable experience. Its hard to come away from a break feeling empty handed, as is the case with my premium products. 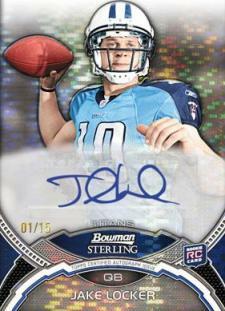 2011 Bowman Sterling Football boils down to two things: rookie cards and hits. Each pack has one autograph, two relic cards and two rookie cards. Entering the season, the total number of NFL games played by those on the 50-card base set checklist: zero. While a few veterans are sprinkled in here and there, they're all part of autograph and memorabilia card programs. Even then, the spotlight is still largely on the rookie class. 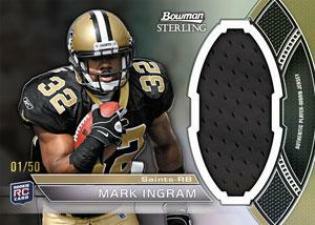 See the top cards in the set with our 2011 Bowman Sterling Football hit tracker. 50-card base set consists entirely of rookie cards. Every pack promises one autograph, two relic cards and two rookie cards. 60-card Autographs checklist includes both veteran and rookie signatures (although few of the non-rookie autographs are hobby superstars). Parallels: Blue Refractors (/99), Black Refractors (/50), Gold Refractors (/25), Pulsar Refractors (/15), Printing Plates, Superfractors (/1). Red Zone Rookie Autographs highlights 36 first-year players. Autographed Rookie Relic Cards (35 cards). Parallels: Blue Refractors (/99), Gold Refractor Patches (/25), Pulsar Refractor Patches (/15), Printing Plate Patches, Superfractor Patches (/1). Autographed Veteran Relic Cards (35 cards). Parallels: Blue Refractors (/50), Gold Refractor Patches (/25), Pulsar Refractor Patches (/15), Printing Plate Patches, Superfractor Patches (/1). Multi-autographed rookie cards: Dual (ten cards, /25), Triple (five cards, /10), Quad (five book cards, /10) and Six (five book cards, /10). All have patch parallels (/5). Pulsar Refractor Dual Autographed Relic Cards (35 cards) include two signatures and two relic pieces. With two Relic Cards falling in every pack, there's 12 in a box. The checklist includes 40 rookies and 15 veterans. Parallels: Refractors (/299), Blue Refractors (/99), Gold Refractors (/25), Pulsar Refractors (/15), Printing Plates, Superfractors (/1). Rookie Black Refractor Jumbo Relic Cards (40 cards, /50). The 25 Dual Relic box toppers mix veterans and rookies. Parallels: Refractors (/75), Blue Refractors (/50), Black Refractor Patches (/25), Pulsar Refractor Patches (/15), Gold Refractor Patches (/5), Printing Plate Patches, Superfractor Patches (/1). First Topps Terrelle Pryor autographs to appear in 2011 Bowman Sterling Football. 2009 Bowman Sterling CHASE DANIEL AUTO RC ROOKIE QB BEARS # 299!